ASUS ROG Phone ZS600KL - 128GB - UK SIM-Free Gaming Smartphone, 6" FHD+ Display. 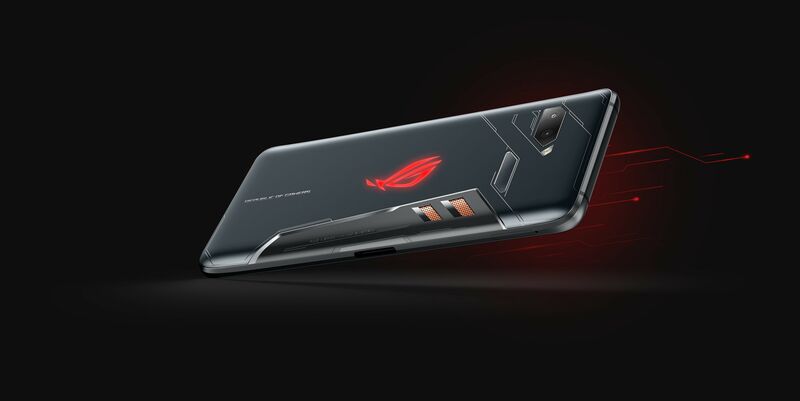 Using a combination of tough, precision-crafted 2.5D- and 3D-curved Corning® Gorilla® glass, diamond-cut highlights and copper detailing, the metal-framed, water-resistant ROG Phone combines battle-hardened construction with a supremely comfortable gaming grip for an unrivaled gaming experience. 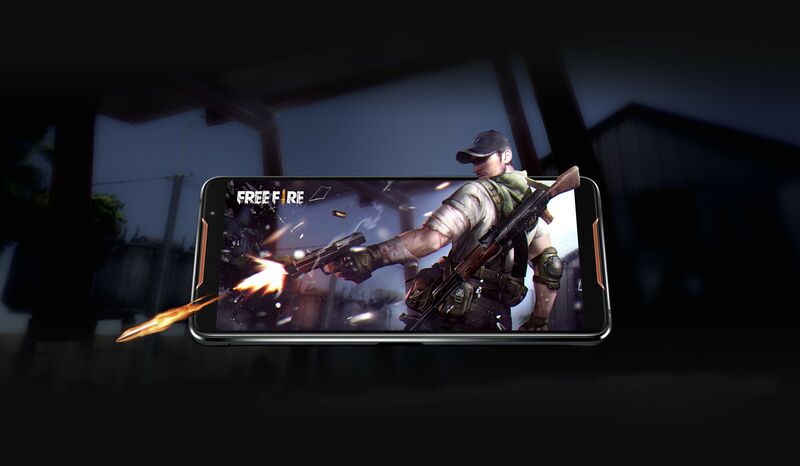 ROG Phone feel instantly good in your hand, ready and waiting for the call of duty. ROG never compromises, especially when it comes to performance. ROG Phone takes mobile gaming performance to the next level, with each and every component optimised for a lag-free, responsive experience. Each octa-core Qualcomm® Snapdragon™ 845 Mobile Platform CPU is speed-binned and specially selected for maximum performance — including sustained clock speeds of up to an incredible 2.96GHz — and the Adreno™ 630 GPU is a gaming powerhouse, with graphics performance outstripping the previous generation by up to 30%. ROG Phone delivers consistent, smooth and stable frame rates with no lag, even during the toughest marathons. And since performance means nothing if your internet connection is slow, ROG Phone also packs ultrafast wireless connectivity in its inventory, including Cat 16 LTE and the latest 802.11ad gigabit-class Wi-Fi. A high-end phone running graphics-intense, fast-paced AAA action games can generate a killer amount of heat. As well as being uncomfortable to hold, a hot phone is a slow phone: thermal throttling can bring even the fastest CPU to its knees and turn your battle royale into a freeze-frame wipeout. 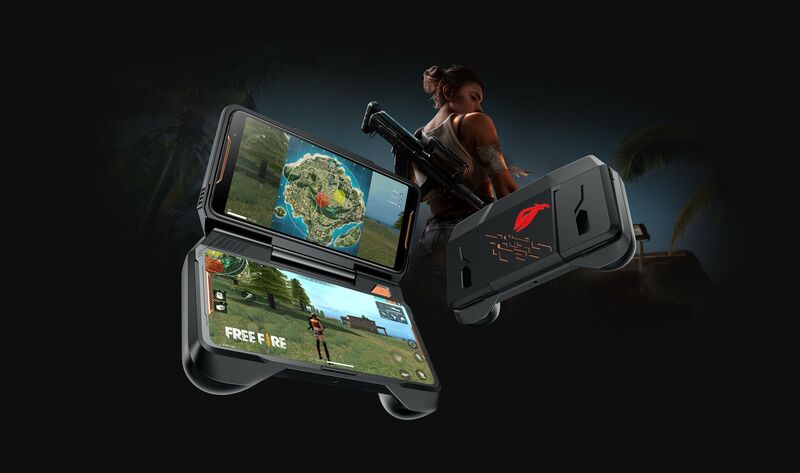 ROG Phone is built from the ground up to run smoothly even when the action gets frenetic: its exclusive GameCool system features highly efficient 3D vapor-chamber cooling inside, enhanced with a copper heat spreader and carbon cooling pads on the circuit board for maximum cooling performance. There’s also a detachable external AeroActive Cooler for an extra cooling boost when the going gets really tough. With GameCool, hot hands and spoiled games are a thing of the past. 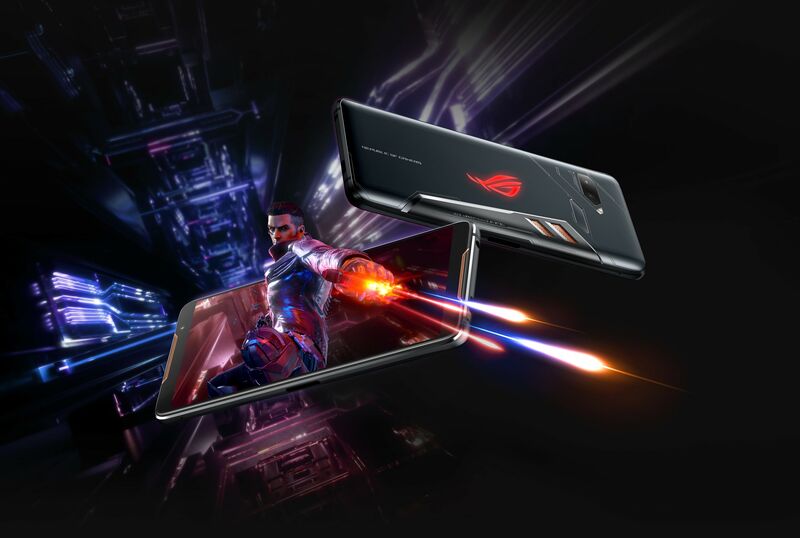 The ultimate gaming phone deserves the ultimate display — something that the ROG gaming heritage makes us uniquely qualified to deliver. ROG Phone uses an ultrafast AMOLED display with a 90Hz refresh rate and a jaw-dropping 1ms pixel response time for blur-free visuals that are as smooth as silk. With a wide 108.6% DCI-P3 colour gamut, colours are incredibly vivid too, so game worlds look as glorious as they were intended, and HDR visuals with a 10,000:1 contrast ratio help reveal every hidden detail in the shadows. Charging a phone while you’re playing is almost guaranteed to hurt your game: standard phone layout makes it impossibly awkward. With ROG Phone, we threw the design book away and started from scratch, optimising the layout for landscape-mode gaming. The result is a revelation, with an additional side-mounted custom USB-C™ connector that supports direct charging, HDMI output, gigabit LAN and headphones. And when the AeroActive Cooler is deployed, you get a side-mounted USB-C port and 3.5mm headphone jack for unhindered gameplay. The side connector’s also used for exclusive expansion modules, including the Mobile Desktop Dock and TwinView Dock. With ROG Phone, you can game in total comfort! In any game, precise control is the key to victory, but the lack of physical buttons on phones means your thumbs have to work overtime. Unless you have a ROG Phone, that is! 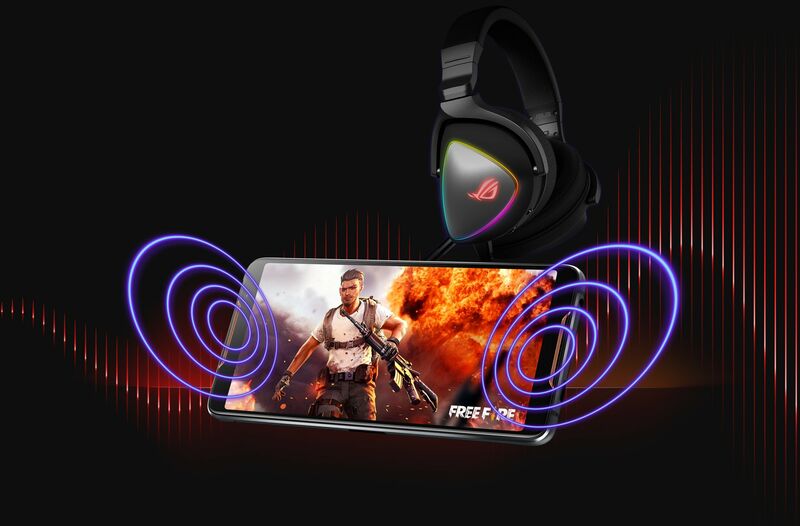 ROG Phone is designed to give you a more console-like gaming experience, with three unique ultrasonic AirTrigger touch sensors. Two of these ultra-responsive sensors are optimised as left/right triggers at the top of the display for landscape-mode gaming (the third is designed for use in portrait mode), and they’re fully programmable to activate any available on-screen action: aiming, firing, inventory selection, steering, navigating — in fact, anything that normally requires a screen tap. 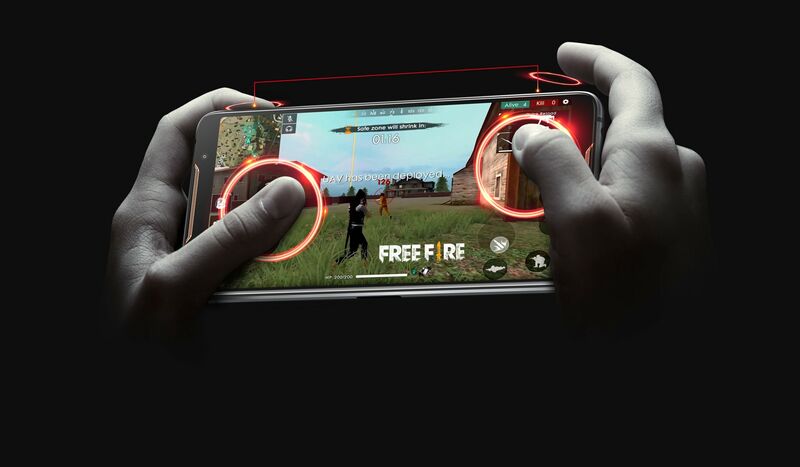 With ROG Phone, you gain two extra fingers to control gameplay, giving you the edge over your poor thumb-bound rivals! As AirTriggers use ultrasonic technology, they only need a feather-light touch, too — just 20g compared to rival touch-sensitive controls that need up to 4x the force. ROG Phone also has an advanced haptic actuator built in for powerful force feedback, so you can feel all the action! Intense gaming action demands superbly detailed and immersive sound if you’re going stay one step ahead of your adversaries. ROG Phone delivers truly incredible and immersive audio, with ultra-powerful front-facing stereo speakers driven by smart amplifiers that maximise volume and minimise distortion. The 24-bit/192KHz audio engine supports Hi-Res Audio files, and there’s DTS Headphone:X™ support for theater-quality surround-sound over headphones. You can also enjoy crystal-clear high-definition audio over Bluetooth®. Games have never sounded this good. It's easy to get optimum gaming performance on ROG Phone, with the special X Mode. With just a single tap, you can free up all background RAM and dedicate it to games, optimise game-data processing performance, and maximise the efficiency of the AeroActive Cooler. X Mode also prevents RAM-eating and battery-sapping app activity, based on a customisable list of apps. ROG Phone is ready for action! 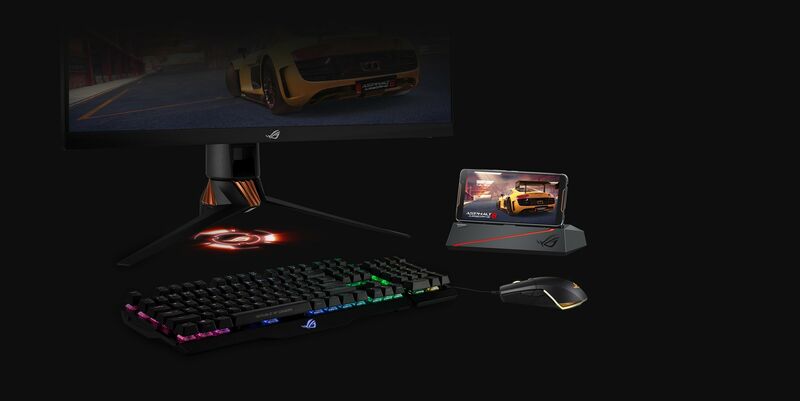 With the amazing TwinView Dock, you can turn your ROG Phone into a powerful dual-screen console for the ultimate gaming and live-streaming experience. As well as its 6-inch AMOLED (2160 x 1080) auxiliary screen, it packs a front-facing quad-speaker system, two extra physical trigger buttons, dual haptic- feedback engine, an enhanced cooling system and a high-capacity 6000mAh extended battery pack. You can extend your game onto the second screen — great for for maps or inventory — or use it for text and video chat. It’s also an awesome platform for live-streaming creators or team play: interact with your audience or team on one screen while playing on the other - the possibilities are endless! 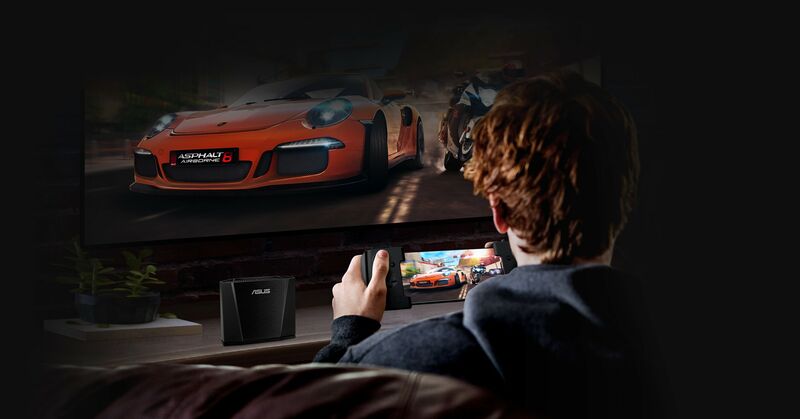 With Gamevice and the ASUS WiGig® Dock, ROG Phone morphs into a portable console with a full inventory of physical gaming controls and ultra-low-latency wireless display connectivity featuring Qualcomm® 11ad technology for 60GHz Wi-Fi. It packs dual analog joysticks, left and right fire triggers and bumpers, a D-pad, along with A, B, X, Y and L3, R3 buttons. You can game on the go using just the Gamevice, or connect via the WiGig® Dock for immersive big-screen gaming.